Miss Melee’s hair is out, so you know she means business! Hey, this is shaping up to be really cool. Miss Melee’s design is awesome. And she’s only 35, ooh-la-la. I’m enjoying the artwork, but the story seems to be developing slowly. I’ve just started reading Top Web Comic, and most of the other strips I’m reading have introduced more characters by now, laid the groundwork for some mystery, or developed at least two if not three plot threads. Please take this as constructive criticism, not complaining. 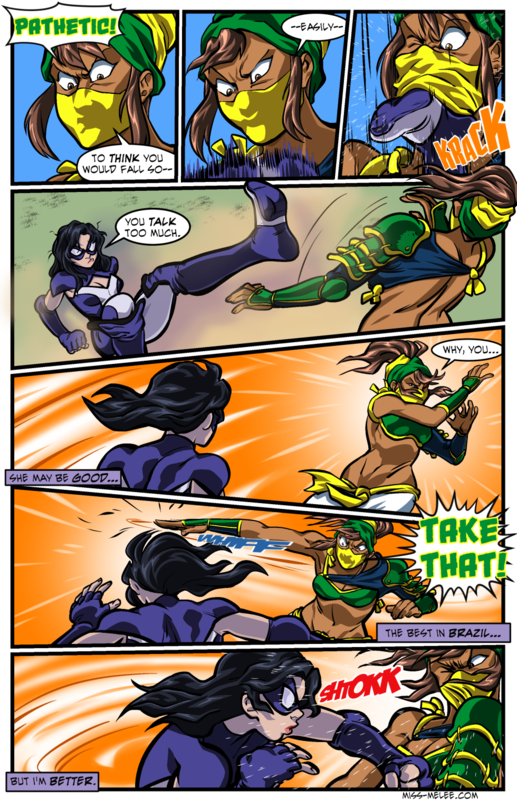 I plan to continue reading Miss Melee and look forward to seeing how it develops. Yeah, whenever someone loudly declares that they’re ‘the best’ in/at something, you can pretty much infer that they’re nowhere close.